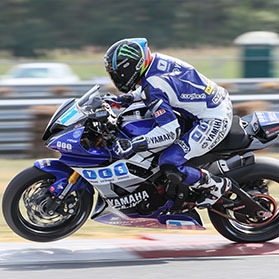 Graves Motorsports Moto1 Cat Back Exhaust Can for the 2015-2019 Yamaha R1. The all new Moto1 canisters are constructed from 100% Aerospace grade hi heat Titanium alloys. Featuring built in mounting tab for a seamless race inspired design. This product is intended for closed course competition use only. NOTE: Dyno Graph shown is with the moto1 slip-on and FTEcu Flash tune kit using the GravesSpec map available in the Graves section of Flash Tune's database. These system retain the factory cat / muffler system under the bike while adding a sleek affordable option for that doesn't require tuning (we do suggest using one of the optional FTEcu tuning products to unlock your new R1's full potential). The meticulous welds found on Graves products are amongst the elite in the motorcycle industry. See the video for sound clips of the exhaust running. The throaty gp sounds are incredible without being obnoxiously loud. The weight saving and looks make this a great option for your new R1! Quality race inspired performance products by Graves Motorsports. Laser etched logos are now standard on these silencer for a stealth and clean look.